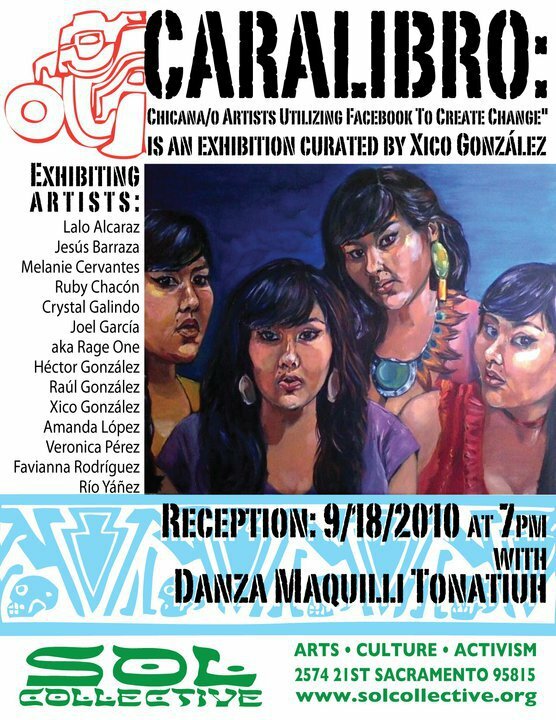 This Saturday I will be in Sacramento for the opening of Caralibro: Chicana/0 artists utilizing facebook to create change. The exhibit was assembled entirely through facebook by curator Xico Gonzalez. This is a fascinating strategy to assemble an exhibit and something I view as the future of curating. Recruiting artists through social networking sites is a tactic I’ve utilized for my curatorial work but this is the first time I’m aware of an exhibit being entirely assembled via facebook. Come see the results this weekend at the Sol Collective gallery. This is my first exhibit in Sacramento and I’m really excited to set foot as an artist in the state capital. I’ll be exhibiting alongside my good homies Jesus Barraza, Melanie Cervantes, Favianna Rodriguez, and Lalo Alcaraz. I’m really excited that I’ll also be showing with artist Crystal Galindo. I’ve been following Crystal’s artwork recently and love her self portraits. The way she utilizes her own body in her work is so inspiring to me. Crystal’s work is featured in the promo image above. Previous postEl Grito – With Podcast!